A Rinkya Blog: Japanese Teen Wins Rubik Championship! The 25th Rubik's World Speedcubing Championship took place this weekend in Budapest Hungary, which is home to the creator of Rubik's Cube, Erno Rubik, who handed out prizes at the event. Yu Nakajima, 16, won the event- solving the Rubik's Cube 5 times with an average time of 12.46 seconds. 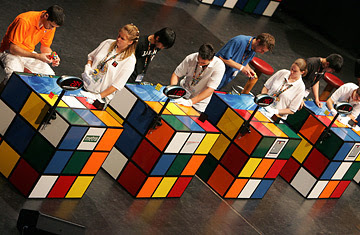 Other events included using just your toes to solve the puzzle, wearing a blindfold and using larger Rubik's Cubes. Japan may have lost the Nathan's Hot Dog Eating Contest but have redeemed themselves with Rubik's Cube!